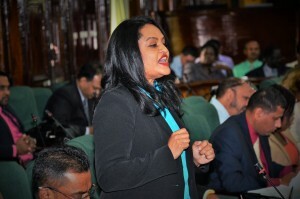 People’s Progressive Party (PPP) Member of Parliament Dr Vindhya Persaud says she will be forced to withhold her support for Budget 2016 since it lacks tangible projects for the empowerment of women. Persaud made the statement as she delivered her take on the 2016 Budget during the debates on Wednesday. The third speaker for the day, the MP indicated that the Budget presented to the House does not have any tangible programs for the empowerment of women. She pointed to the Women of Worth (WOW) program which she claimed was being “genderized” to serve all genders. “The $230B budget has failed to deliver transformative initiatives which will impact on women’s financial enablement and skills development and has not offered a plan for structural support to women,” said Dr Persaud. She went on to state that “cosmetic mergers” of the Women’s Affairs Bureau and the Men’s Affair Bureau will not address the fact that women are still being paid less than men; even if, this is done in conjunction with the advancement of a new gender policy. Meanwhile, Social Protection Minister Volda Lawrence delivered a sharp response to Persaud stating that the Ministry has over $9B to expend in 2016 with several new programs to come on stream. Referring directly to the WOW project she stated the program will now be known as the POWER Program – People of Worth Entrepreneurial Resources Project. “While in the past, WOW focused on women, POWER will provide loans to both males and females married and not married,” she stated.